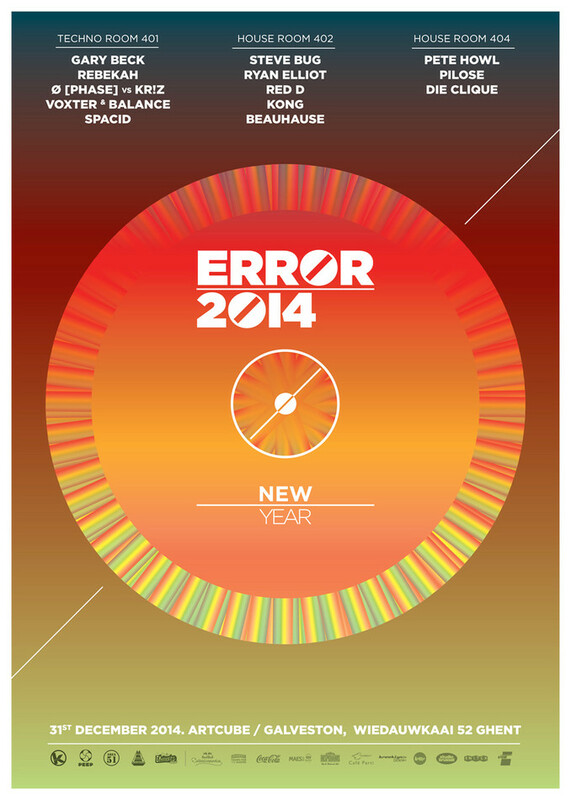 On 31-12-2014 the year 2014 goes in Error. We're leaving another year behind and welcome 2015 in the right setting and atmosphere, and more importantly with the right music. After the success of the previous New Year editions, Kozzmozz, Peep, Area 51 and Elements festival had no choice but to join their expertise once again and bring you another mind blowing night of techno mayhem and house sexiness. In good tradition, we will land in the great industrial environment of the Galveston building where we will present you with three rooms fitted with amazing Function One sound-systems and great light- and visual effects for an unforgettable end of another great year. And as always, with a line-up to die for! The techno room is headed by Gary Beck from Drumcode, Cocoon and Soma Records fame, amongst others. He’s one of the new bright stars on the techno firmament and watched closely by the biggest on earth. His label BEK Audio has developed into one of the strongest techno labels of the moment with a back catalogue of artists such as Slam, Mark Broom & Speedy J and Gary beck himself. He will be joined by Rebekah, the new leading lady in techno who’s adored by artists as Richie Hawtin and Chris Liebing. She recently joined Chris’ CLR camp but is also known for other prolific productions on labels as Cult Figures, Naked Lunch, Coincidence, 8 Sided Dice and Stolen Moments. And then a very special treat from our resident Kr!z who will be bringing a back-to-back set with Ø [Phase] who released his debut album ‘Frames of Reference’ on Kr!z’ Token label. Both artists as well as Token are hugely respected in the techno scene around the world and we’re sure their joined forces will be of the highest standard. And no techno blast without Spacid and Voxter & Balance who will be showing you why Kozzmozz and Area 51 are such experts in the field. First big star in the big house room is none other than Steve Bug, a man who’s been at the forefront of the whole house movement for over 20 years. And now he’s celebrating the 15th B-day of his immensely popular Pokerflat label. He will be celebrating this special anniversary with a digital ’15 Years of Pokerflat’ compilation and an exclusive tour around the best events in the world. It speaks for itself that we’re very happy to be part of it. Our next guest originates from Detroit but is now living in Berlin. He’s one of the residents of the hugely adored Panorama bar and mixed their 6th compilation. Ryan Elliott has also developed his Spectral Sound label into a well respected platform and produced several huge tracks for Ostgut Ton. They will be accompanied by the best house talent from our own backyard. First of all, veteran and We Play House guru Red D, next Kong from the 22tracks platform and the Playground radio show on Studio Brussels and last but not least, women power in the form of Beauhause who only started playing together last year but are already causing international waves in the house world. And why not more house as we all seem to love it. The smaller house room will have a bigger underground feel with different house beats and we wouldn’t be surprised if some might dare to drive the tempo up a bit from time to time. One thing is for sure, they will make it hot & sweaty on the dance-floor as they are used to doing on a fairly weekly basis. Pete Howl as resident behind the decks of the infamous Decadance club where he also organizes several own concepts as Tijgerkracht, Vlammenwerper and more. And also Die Clique is able to serve you a vivid, diverse and breathtaking ride with his staggering reputation as fully fledged member of the Feestgedruis crew. Add to those Pilose who’s one of the rising talents of the moment and known from the radio-show as well as several party concepts under the Ohm banner and you know the night is complete! A new year’s night in which there will be no room for Error, just pure fun and dancing away to your favorite beats till the morning comes!